Let us enter into one of the luminous mysteries by considering the virtues and the beatitudes. Consider Mary’s Faith. Cana seems to be the very first miracle of Jesus (though even if we’ve seen miracles before, it’s hard to believe they can happen again). She has absolute confidence that Jesus can do the impossible and that he loves us enough to do it, even in this thing, so insignificant and so concretely miraculous. And her faith draws her to Jesus. Consider Mary’s Hope. She believes in Jesus’s power over creation. And she believes in his love for his creation, a love that does not destroy the couple, does not destroy his creation, but builds them up, in the happiest, most affirming way. And her hope draws her to Jesus. Consider Mary’s Charity, her love for God and for man. She loves God’s creation, loves marriage, loves the celebration, loves the wine that blesses it! She loves the couple, thinks of the couple, frets over the couple. Ah, but most of all, think of how she must have loved Jesus, the deep, joyful affection she must have felt when she saw his love for the couple. And love unites her, profoundly, in an ever new way, to Jesus. Consider Mary’s Poverty. She has nothing. She has nothing to offer but her prayers. She asks nothing for herself, but for their happiness. Even what she asks is nothing that can be hoarded, only the pleasure of celebrating human and divine love. And in her poverty she relies on nothing but Jesus, and loves nothing but Jesus, and the joys of his kingdom, celebrated in the marriage feast. Consider Mary’s Sorrow. Such a rich, real, human sorrow: “they have no wine!” Not a selfish sorrow, not a whining sorrow, but a deep compassion for the needs of others, for the deeply human needs of a bride and bridegroom to celebrate their wedding. And because this is what she sorrows for, she is consoled by the presence, the love, the concern of Jesus, only Jesus, who brings the most abundant consolation. Consider Mary’s Meekness. She does not fight, does not blame, does not strive – she only inherits. Meekness does not grasp, but trusts in the Father to provide. “Whatever he says”: we receive everything as total gift, trusting that he will not leave us orphans. And he gives her the earth – not just pie in the sky, Jesus provides wine, here and now, for this celebration, of this marriage. He cares for the meek on the earth – and her meekness binds her to him even more. Consider her Hunger and Thirst for Justice. Justice doesn’t mean punishment or vengeance. It means things should be right. The poor couple! This isn’t right, this isn’t how it’s supposed to be! At Cana, Mary doesn’t only long for heaven, she longs for things to be right here on earth (and so glimpses the true heavenly city, where all is right). She thirsts not for the wine, but for the blessing of their wedding, the celebration as it should be. And Jesus always satisfies. How that love of Justice makes her love him all the more. Consider her Mercy. Misericordia: it is a heart for misery, a feeling of others’ pain. In Greek we say Eleison, connected to begging for alms, eleemosyne. She feels for them; her heart is totally united to their disappointment when their wedding feast isn’t as it should be. She begs for them. And mercy is hers! When she feels mercy for them, she feels even deeper the merciful heart of Jesus. Consider her Purity of Heart. There is nothing selfish here. Nothing worldly, either. 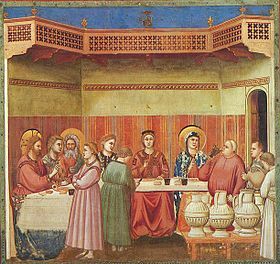 What a wonderful mystery, the wedding feast at Cana: there is nothing impure about weddings, nothing impure about feasts, nothing impure about good wine. It is all the gift of the Creator. Our hearts are impure, and so we experience all these impurely, to be sure. But the pure hearts, Jesus and Mary – in these goods things they see only God, the giver of good. Purity of heart does not hate the world, it just loves God – and loves Jesus, the God who enters into the world, with blessings! And consider how she Makes Peace. Fascinating: there is no war here. To the contrary, what is happening in a wedding, and in a feast, is a union of hearts. The true peacemaker goes far beyond disarming combatants, or putting them in separate corners. The true peacemaker makes a banquet, celebrates real fraternity, real, deep union. Daughter of God, Mary witnesses God as the Father who makes union among his children. And so she sees the real heart of Jesus, the adorable, wonderful, peacemaking Jesus, the Bridegroom who brings joy to every wedding and every feast, here and in eternity. How could you contemplate the loving heart of Jesus today?